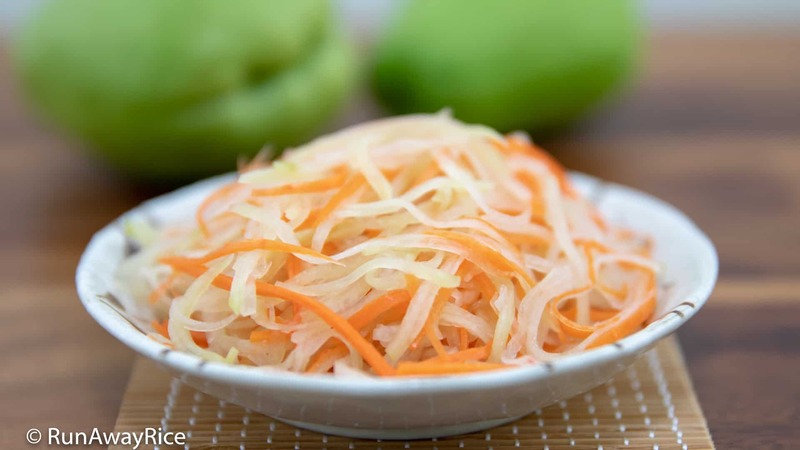 Carrot and Chayote Pickles (Do Chua Ca Rot Su Su) - Easy Recipe with Video! 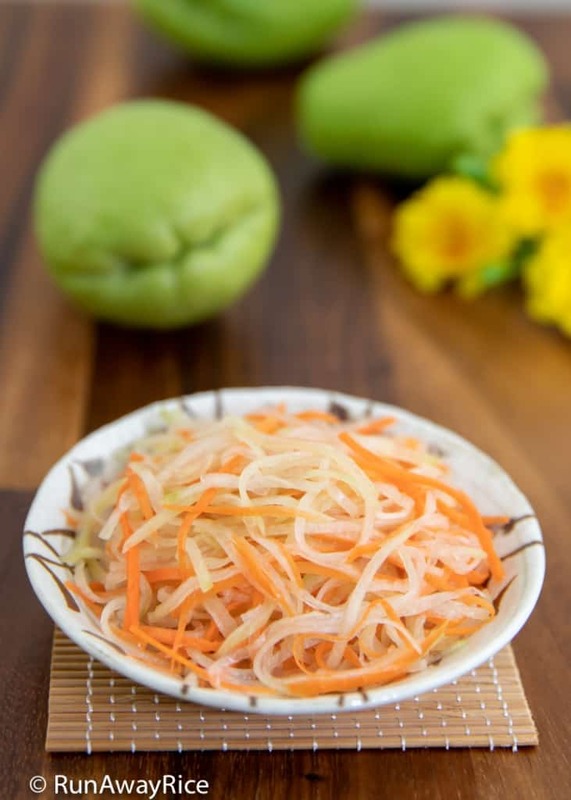 This easy recipe for Carrot and Chayote Pickles (Do Chua Ca Rot Su Su) is a wonderful alternative to the traditional Vietnamese Carrot and Radish Pickles (Do Chua). 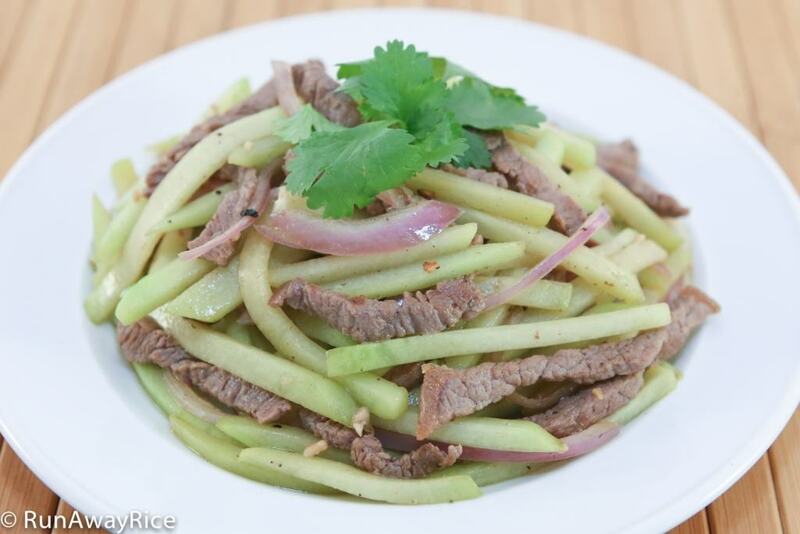 Chayote is a crisp and juicy fruit in the gourd family and it’s so tasty pickled. This refrigerator pickles recipe is really simple: 1) Shred the vegetables, 2) Make the pickling solution and 3) Let marinate. Enjoy the crunchy and tart Carrot and Chayote Pickles in just 1 hour. 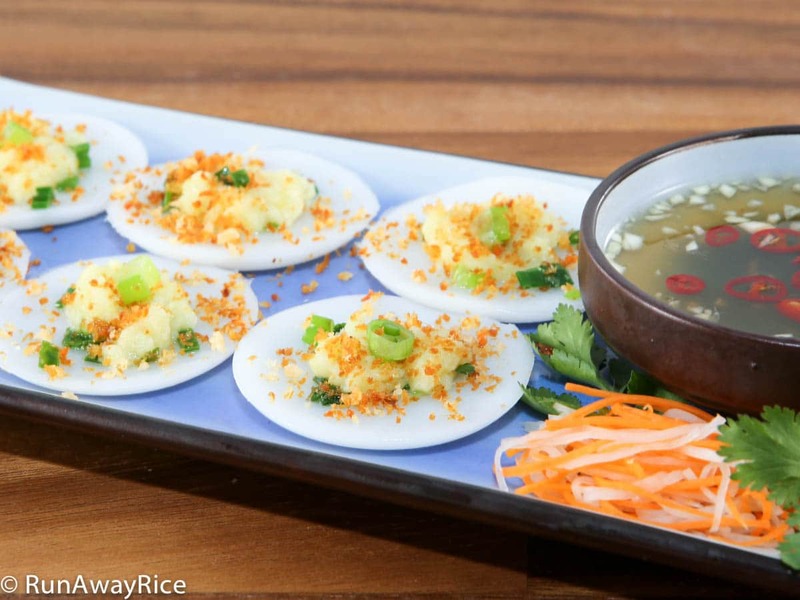 The pickles go great with everything–sandwiches, savory cakes, dipping sauces, rice plates, etc. and add such delicious tartness to compliment robust and savory flavors. 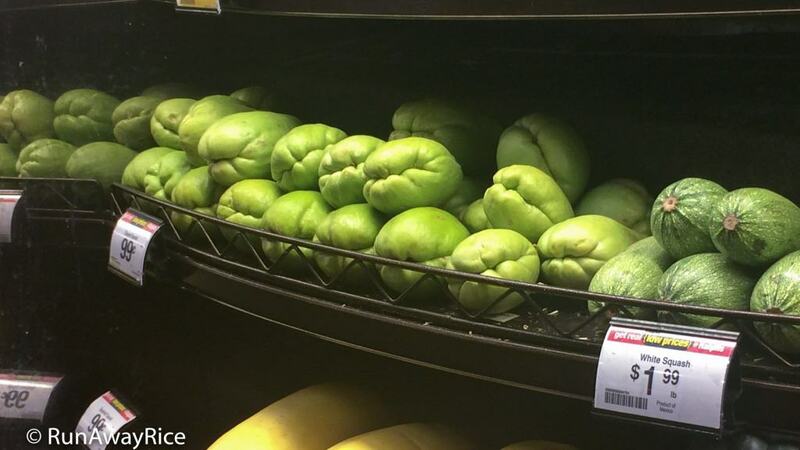 Chayote has smooth, light green skin, is pear-shaped and just a bit larger than a pear. 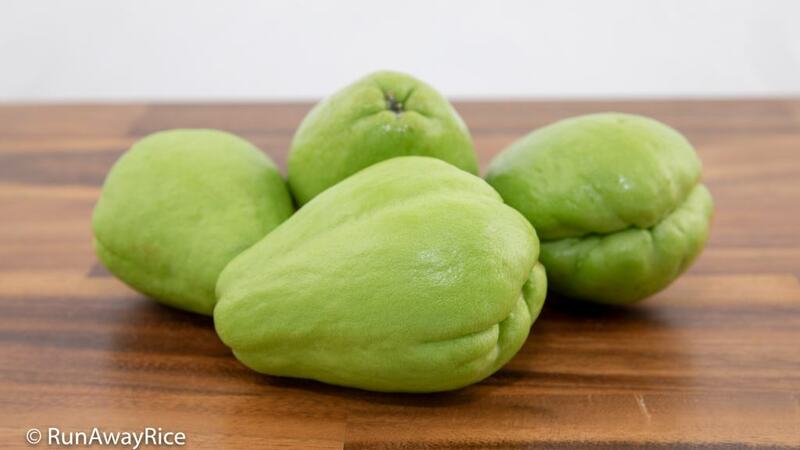 A medium chayote weighs about 7-8 ounces (198-227 grams) and a larger one 9-11 ounces (255-312 grams). For this Carrot and Chayote Pickles recipe, you’ll need a medium-sized chayote. 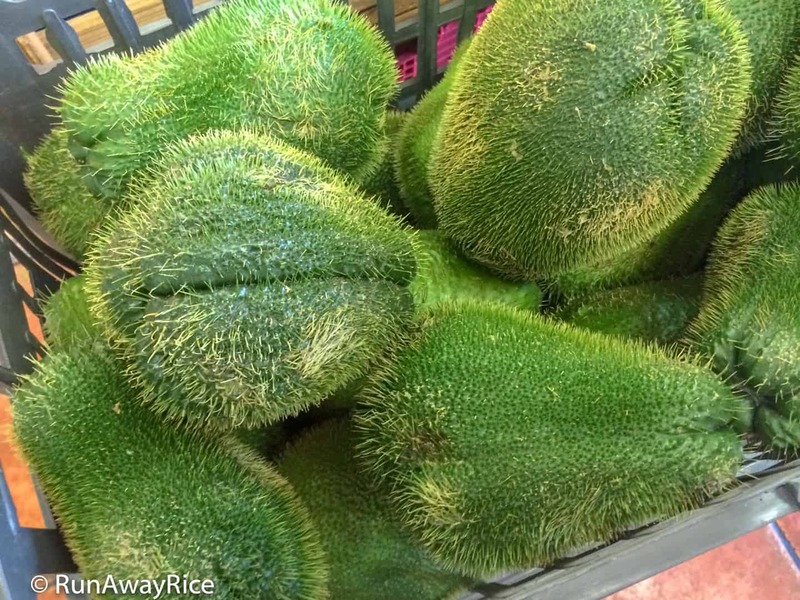 The taste of a chayote is like a cross between a potato and a cucumber. It’s crisp, juicy and refreshing yet sturdy making it an awesome fruit to enjoy raw, as in this pickles recipe, or in a salad. For those who find the Daikon radish in Carrot and Radish Pickles (Do Chua) too pungent, you’ll love the mild taste and aroma of chayotes. Chayotes are indigenous to Latin America but cultivated in Asian countries as well. If you live in southern California, chayotes are abundant and easy to find in American, Asian and Latin markets. 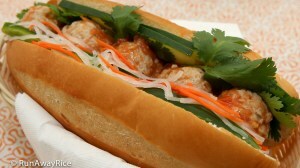 They are fairly inexpensive, priced about $.60-$1.00 per pound. When buying chayotes, select ones with bright light green and unbruised skins. Some chayotes have bumpy, somewhat wrinkled skins but the skins should not be dry and saggy. The fruit should be firm to the touch. Avoid ones with dark-spotted or excessively wrinkled skins indicating they are past their edible life. After bringing the chayotes home, store them in the refrigerator and eat them within the week. If you’d like to keep them longer, here’s a trick: Wash and dry the chayotes well. 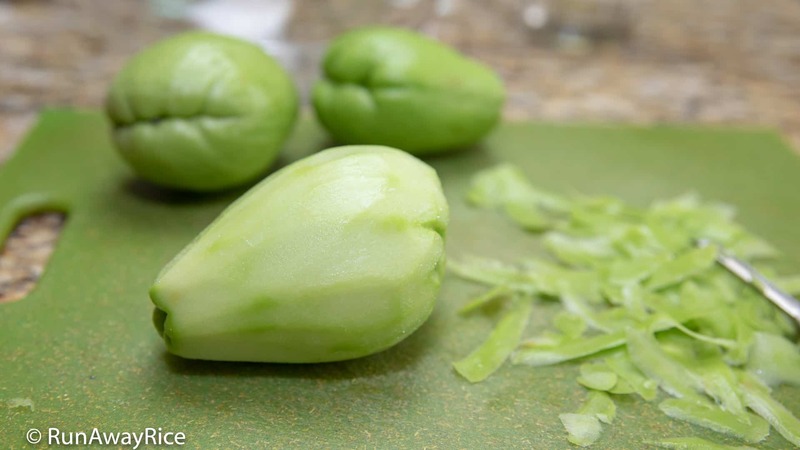 Wrap each chayote with a paper towel. (This helps to absorb any moisture from being refrigerated.) Place the chayotes in a produce bag and store in the fridge. They will stay fresh for up to 3 weeks using this method. Give it a try. You’ll be really surprised how crispy and juicy they remain. When making the Carrot and Chayote Pickles, I like to use the larger carrots. It’s easier to shred a thicker vegetable with a mandoline. You may not use the entire carrot. Save the leftovers for salads or soups. My mandoline is by Benriner. I use the medium shredding blade which is the perfect thickness for a variety of dishes. As with all sharp kitchen tools, care is required. Unless you’re a shredding pro, I recommend using the finger guard to prevent any accidental cuts. I use equal amounts of carrot and chayote but feel free to adjust to your preference. Some people prefer a bit more chayote than carrots. Since you’re making it, it’s entirely up to you! The pickling solution is also very customizable. This is a base recipe so feel free to adjust the acidity or sweetness to your taste. Use 2 (1 pint) jars (or 1 large jar) to store the Carrot and Chayote Pickles. 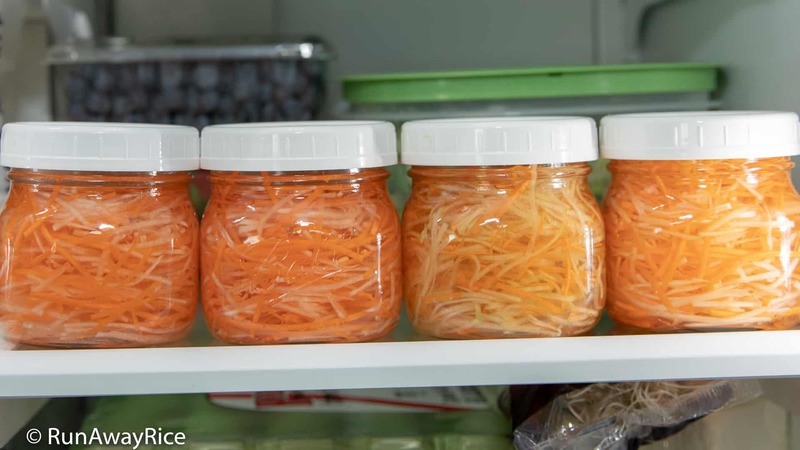 In each jar, put about 4-5 ounces shredded vegetables. Don’t pack the veggies too tightly. Leave room for the pickling solution to marinate the vegetables. These tasty pickles can be refrigerated for up to 1 month. They will keep longer if well-sealed. I get this question often: Can the pickling solution be used again to make more pickles? Answer: Yes it can, but keep in mind, the pickling solution becomes diluted with the water from the vegetables. You can recycle the pickling liquid once. For the best flavor, I recommend always making a fresh batch. This easy recipe for Carrot and Chayote Pickles (Do Chua Ca Rot Su Su) is a wonderful alternative to the traditional Vietnamese Carrot and Radish Pickles (Do Chua). 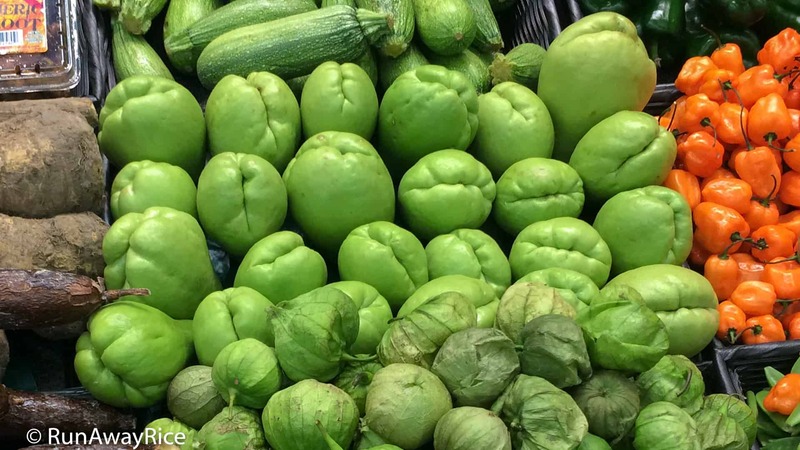 Chayote is a crisp and juicy fruit in the gourd family and it's so tasty pickled. This refrigerator pickles recipe is really simple: 1) Shred the vegetables, 2) Make the pickling solution and 3) Let marinate. 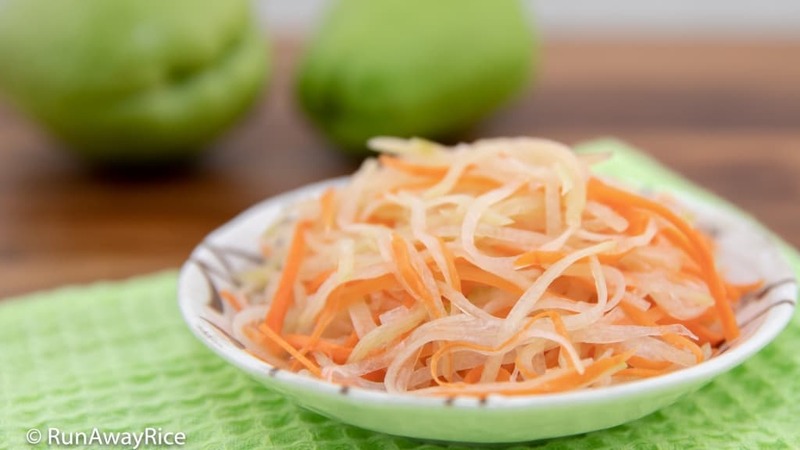 Enjoy the crunchy and tart Carrot and Chayote Pickles in just 1 hour. The pickles go great with everything--sandwiches, savory cakes, dipping sauces, rice plates, etc. 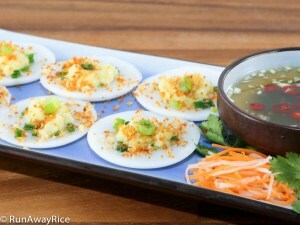 and add such delicious tartness to compliment robust and savory flavors. 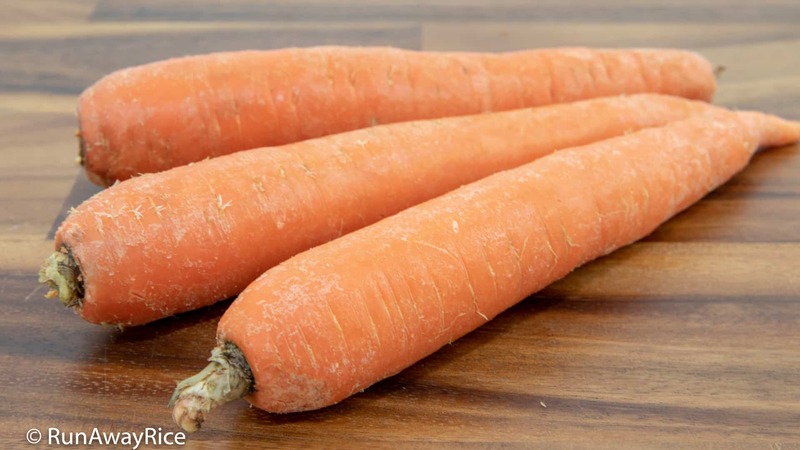 Remove the skin from the carrot and chayote using a vegetable peeler. Rinse the vegetables with cold water and pat dry using paper towels. Cut the carrot into sections about 2 1/2 - 3 inches long. Cut the chayote in half lengthwise. 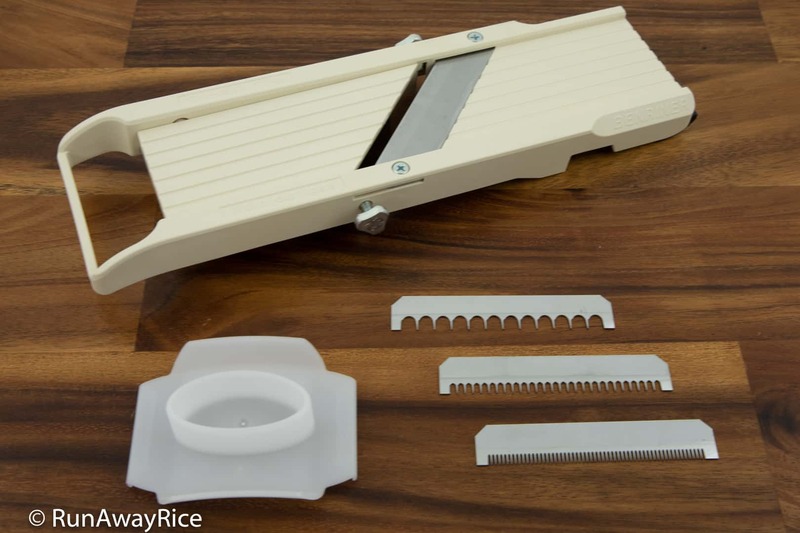 Select the medium shredding blade and attach to the mandoline. Shred the chayote into a large bowl, working around the core. 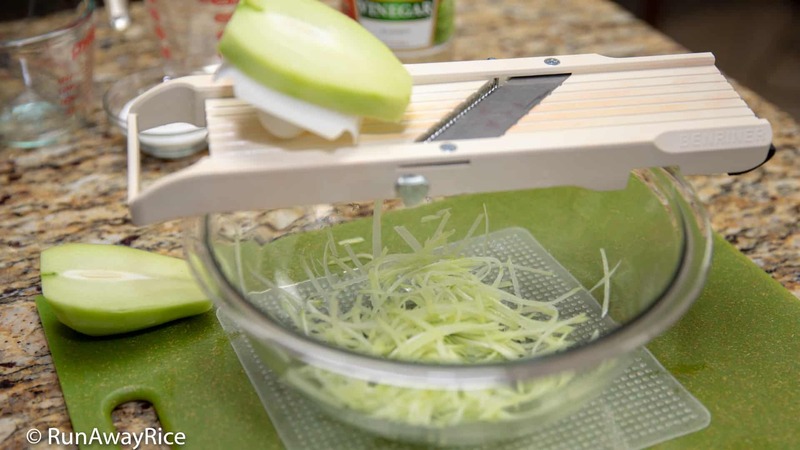 Use your fingers to separate the shredded chayote. Shred the carrots into the same bowl. Toss together to combine the vegetables. 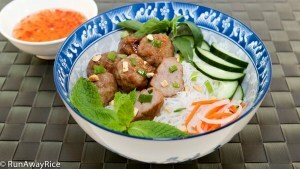 In a medium cup or bowl, add the white vinegar, water, sugar and salt. Stir together until the sugar is dissolved. Transfer the vegetable mixture into 2 (1 pint) jars, dividing it evenly between the jars. Pour the pickling liquid into the jars, dividing it evenly between the jars. Use a spoon to press down on the vegetables and immerse them in the liquid. Cover the jars with lids. Refrigerate for at least 1 hour, longer or overnight improves the flavor. 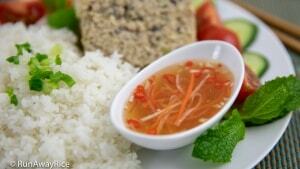 Adjust the acidity and sweetness of the pickling solution to your taste as well. Transfer about 4-5 ounces shredded vegetables in each jar. Don't pack the veggies too tightly. Leave room for the pickling solution to marinate the vegetables. I grow chayotes and always looking for new ways to enjoy them because they’re so healthy for you. Thank you for this recipe!